We took a trip to see how these iconic candles are made, from start to finish. If you're a fan of Yankee Candle, you know the brand for its many yummy scents, from "Clean Cotton" to "Spiced Pumpkin" and "Lavender Vanilla." And if you're like us, maybe you've spent a few lazy afternoons perusing the candle aisle, testing your olfactory skills to see if you can name the scent before reading the label on the familiar jar. But before all that can happen, the candles are created in a factory in central Massachusetts. TODAY Home took a trip there to see how the iconic candles are made, from start to finish. See these giant tanks? They're each filled with wax, which funnels into smaller tanks inside the factory. (Yankee Candle uses more than 175,000 pounds of wax every day!) Additives and fragrances are then mixed in — that's what gives each candle its unique scent. Wicks go in next. They're glued to the base of each glass jar, and later an employee does a "pull test" to make sure they're secure. Step 3: Wax goes in! The wax mixture is dropped into the jars as they move along a conveyor belt. The candles are cooled across multiple conveyors. Step 5: Top 'em off! Since the candles shrink when they cool, they need to be topped off with just a little more wax. A machine applies labels onto the jars, and then they're packaged and shipped to stores ... eventually landing in homes around the world! 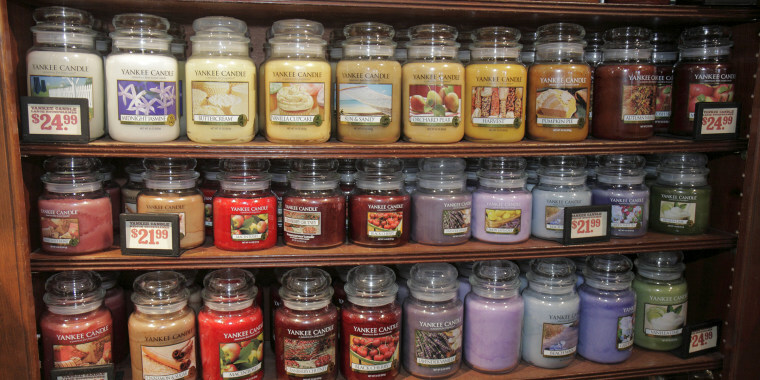 Across all of its product lines, Yankee Candle has more than 50 fragrances. And the company produces more than 200 million candles per year! This story is part of a TODAY series called "The Follow," where we investigate how one product is created from start to finish. We've gone inside the factories of LUSH, Peeps, Crayola and more. Take a look at how Burt's Bees lip balm is made below!